After Coal: Welsh and Appalachian Mining Communities is a documentary in progress. This article, published in the Daily Yonder, offers context to the project. Enjoy! “Communities always change, industries come and go. It was foolish of us to think at the end of the 1985 miners strike that it was the end of the world – it was an opportunity for a new beginning” – Hywel Francis, Member of Parliament representing former Welsh mining valleys. What happens when fossil fuels run out? How do rural communities reinvent themselves as natural resources are depleted? In the Appalachian mountains, where coal mining is projected to decline dramatically this decade some people are looking to Wales for answers. The challenges to Wales and Appalachia in recent decades are tragically similar. The Welsh coalfields were mostly shut down in the 1980’s, with a loss of more than 85,000 jobs. Wales is about the size of the state of New Jersey, and the coalfields cover the southern quarter of the country. These twenty narrow valleys were the cradle of the industrial revolution. At the dawn of the nineteenth century, Welsh factories began to produce iron, steel, and tin. 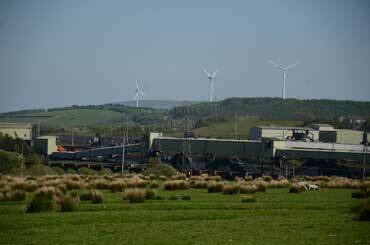 Welsh coal reserves fired the rising industrial order. By the turn of the twentieth century the population of the mining towns had exploded and more than one quarter of the workforce worked in coal. Historian John Davies writes that in 1914, more than 230,000 men were employed by the coal industry in 485 pits across South Wales. After World War II, all coal mines in the United Kingdom were nationalized – along with the rail, steel, and utility industries. The intent of nationalization was to set up a system that would use Britain’s resources to benefit the British people as a whole, rather than a small number of mine owners or shareholders. Nationalization was a goal of Britain’s growing Labour Party, and the National Union of Mineworkers carried considerable political clout. During the 1970’s and 1980’s, ownership of coal and other energy resources consolidated, as multinational energy conglomerates bought up mining companies around the world. During this period of time, the nationalized coal industry in the UK faced tough competition from companies such as Royal Dutch Shell, which owned mines in South Africa. At the time Royal Dutch Shell also held a controlling interest in the A.T. Massey coal company, which had extensive holdings in Appalachia. In both Wales and Appalachia the globalization of the coal industry had a devastating impact on coal mining communities, as the 1980’s saw bitter strikes where union miners fought to keep well paying jobs in both Welsh and Appalachian mining communities. In both the US and the UK, miners’ unions (and all of organized labor) lost wages and influence after the strikes of the 1980’s. However, in Wales, the 1984-1985 miners’ strike laid the groundwork for community regeneration. One example of Welsh efforts to reinvent their rural economy is the DOVE Workshop.DOVE stands for the Dulais Opportinity for Voluntary Enterprise. Located in the village of Banwen at the head of the Dulais Valley, DOVE was started by a group of women who came together during the 1984 – 1985 miners strike. These women understood that the coal industry would no longer provide large-scale employment in their communities, and decided that community-based education was the most practical path to regenerate the local economy. Setting up shop in an abandoned mine office, they developed a series of adult education workshops for women. Three decades later, the DOVE building hosts a diverse set of small-scale entrepreneurs, including a daycare, library, a community garden, and a café featuring local foods. In the Afan valley, government efforts turned thousands of acres of abandoned mines into a mountain bike park and the South Wales miners museum. Visitor Center manager Leigh Acetson says the two attractions bring 120,000 visitors to the former mining valley each year. 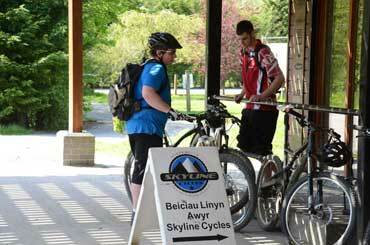 Mountain bikers gather outside of the bike shop at the Glyncorrwg Visitors Center. Tourism has become part of economic development plans. This focus on the service economy has made economic recovery in the Welsh coalfields a slow process. Still, many resourceful entrepreneurs are finding a way. Geraint Lewis left a corporate job in the city to return home to the former mining town of Seven Sisters in the Dulais Valley. Back in his hometown, Lewis started Call of the Wild. At first glance, Call of the Wild appears to be an ecotourism company, leading youth and adults on outdoor adventures such as hiking, rafting, and repelling. However, to avoid the pitfalls of the seasonal tourism industry, Lewis deliberately created a leadership development business, providing services for a range of corporate clients and offering year round employment at a living wage for local people. Lewis says: “We wanted to start this training and development company using the outdoors as our classroom, but there was nobody doing it in the South Wales Coalfield. We had a lot of raised eyebrows from business consultants and bank managers…but we persevered, and I think we succeeded very quickly.” Today, Call of the Wild has more than 30 year round employees and owns pubs in the former mining village of Seven Sisters and Ystradglynlais. There is no magic bullet to economic recovery in coal mining regions. Former mining communities in the Welsh Valleys are doing better than the 1980’s, but population has dropped and employment remains low. The first step to regeneration was “greening the valleys” – government programs to clean up mine waste piles, acid mine drainage, and other sources of pollution. Naturally, government resources are required for large-scale reclamation to be successful. In order for government to be effective, rural people need to be actively involved in the process of government. This means that grassroots organizing is an important element of economic regeneration. The longest lasting initiatives in Wales involve local people creating their own programs to meet community needs, such as the DOVE Workshop in Banwen. Perhaps most importantly, the topic of energy is still an intensely debated issue. In some areas coal is making a small resurgence – the latest figures have between 800 and 1000 miners working in Wales. Meanwhile, energy corporations and the Welsh government have made a huge commitment to wind power – spinning turbines are commonplace above the former mining valleys. The government has partnered with private power companies to develop these wind farms and is now exploring large-scale tidal power. On the surface this all sounds good. However, these former mining communities have well founded concerns about outside corporations developing local energy resources without investing in the community. When residents of the former Welsh mining valleys look at proposals for industrial scale wind farms from multinational energy corporations, many wonder when these corporations will pull out, leaving communities to fend for themselves once again.